Ben had another busy fun week, but one where I forgot to take a whole lot of pictures! We started out the week with the MDA Walk in Arlington, where Ben did a little walking and a little riding on Daddy's shoulders. It is still his preferred position. 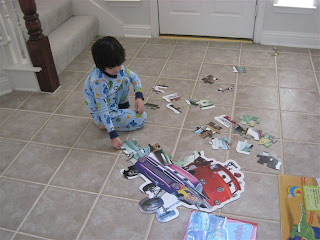 He did a little bit of his workbooks, I think it was a color & shape one with Max & Ruby on it. He also is still enjoying some of his computer games and the Wii, but while I have lifted the media ban, the media limitations are now firmly in place. 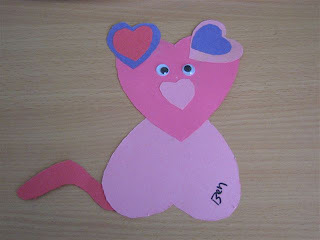 We didn't do many fun crafts at home this week, but he made an adorable heart kitty cat at church on Wednesday night! I accidentally thought it was a mouse and was instantly corrected. 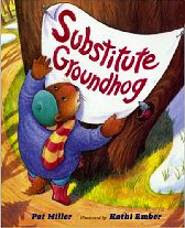 We also made the Groundhog Day I See ... book from Enchanted Learning. Other than that, the boy has been practicing his taekwondo. He is learning the first white belt pattern, even though he is technically in the Little Dragons class (this is the class for the kids that are too young to really start). However, he was able to show the lead instructor that he does know the entire pattern, so he got the go ahead, if we want, to move up to the regular kid class! We probably will give him a little more time in the younger class though. At 4.5 years, he is the youngest kid in his class, so he'd really be much younger than anyone in the next class. No hurries though, at least he has the option to join Faith on the days where there isn't a Little Dragons class for him.